Welcome to our specialty store area. Although most of our items are sold directly from Amazon, this page will feature specialty products direct from the Museum itself. We are not as fast as Amazon in mailing, so it may take a few days, but well worth the wait. 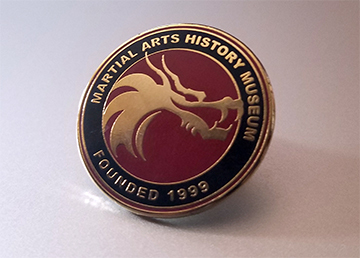 This is our very first pin designed for the Martial Arts History Museum. It’s a very elegant pin with a rubber fastener on back. The complete museum logo is featured in gold, black and burgundy. A very nice piece to wear and support the museum. The price of the pin is very affordable. Cost of the pin is just $10. Plus an additional charge for packaging, postage and mailing (you will receive an extra little token in your package as well). Note: sales are limited to the USA only.